Growing up around her grandfather’s dental practice, Kelsey had always planned on joining the dental community. She graduated from Mount Ida College in 2010 with her license in Local Anesthesia Administration. 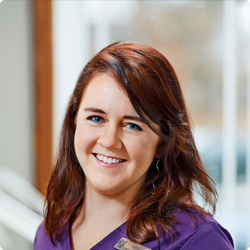 Now entering her fourth year at Nashua Dental Group, what she appreciates most about her work is building trusting relationships with her patients. Her goal is to be there for her patients and make them feel as comfortable as possible. Outside of the office, Kelsey enjoys traveling and surrounding herself with new experiences. She is a lifetime resident of New Hampshire and an active volunteer for local non-profit organizations.